The Olive Oil Granola recipe made me a convert – I’m now mildly obsessed with adding olive oil to all things sweet. I must admit that this obsession started way before Olive Oil Granola took the food blogosphere by storm. As with many delicious indulgences, cough it all started with Mario Batali. Years ago, I went to Otto with my then-co-workers for some celebration now long forgotten. Because I have an undying need to order the most odd-sounding thing on the menu, my dessert that day was Olive Oil Gelato with Passion Fruit Granita. It was the creamiest, most luscious gelato. Smooth, sweet with just a hint of olive oil. It was fantastic. And so was the olive oil granola, and so too is olive oil cake. So, I ask you – what’s stopping me from making olive oil cookies? As of this morning, nothing! Using the same flavors and spices from the granola, I made these Spiced Olive Oil and Pistacho cookies. Just like the gelato, the olive oil flavor comes through, but instead of overpowering the cookies, it adds a lovely richness. 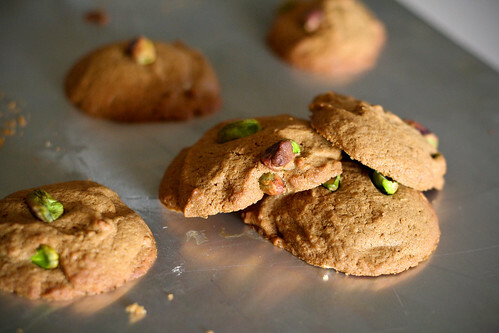 The cardamom, cinnamon and ginger add enough of a bite and the pistachios give these cookies some texture. Preheat your oven to 375 degrees. (Note: I set mine to 350Â° because itâ€™s convection) and line a cookie sheet with parchment paper. In a medium bowl whisk together the flour, baking powder and salt until evenly combined. Set aside. Cream the butter, olive oil, sugar, molasses and honey in your electric mixer with the paddle attachment (or use a hand mixer, or whisk vigorously by hand). Add the egg, then scrape the sides down and add the vanilla, cinnamon, cardamom and ginger. Mix until incorporated. Carefully, add the dry ingredients to the wet ones, stirring with the mixer or by hand until your dough forms. 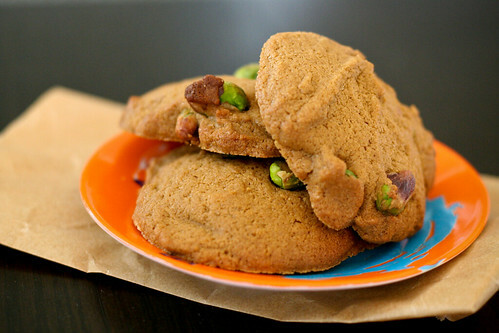 Fold in the pistachios until evenly distributed throughout the dough. Use a tablespoon to measure out little dough balls onto the prepared cookie sheet. Bake for 10 minutes in the center oven. Make sure you donâ€™t over-bake them or theyâ€™ll get too crispy and lose all of their chewiness. I, too, fell in love with the olive oil granola. These are some of my favorite flavors to put in a cookie – I just might have to bake these! This sounds so intriguing. I might have to figure out a gluten-free way to enjoy cookies such as these. I have a sneaking suspicion some almond meal might work for the flour…we’ll have to see! I love this combination, sounds delicious. the sweet & olive oil combination reminds me of a snack I used to eat in Spain when I was studying abroad. I had some shoes made by a very chatty shoemaker on Calle Espiritu Santo in Madrid. Somehow we got around to talking about what he ate to stay “strong and robust” when there wasn’t enough jamon serrano to go around during the times of the Civil war: crusty bread with olive oil and sugar! If you haven’t tried it already, give this lazy snack a shot: toast some crunchy french bread, douse it in your best, most aromatic olive oil, and add sugar. meanwhile, I’ll work on trying out this beautiful cookie recipe. Melissa V – Crusty bread with olive oil and sugar? Yes please! The main type of fat found in all kinds of olive oil is monounsaturated fatty acids (MUFAs). MUFAs are actually considered a healthy dietary fat. If your diet emphasizes unsaturated fats, such as MUFAs and polyunsaturated fats (PUFAs), instead of saturated fats and trans fats, you may gain certain health benefits. ;-^..